But during circulation, extra pressure is applied by the mud pumps to circulate the drilling fluid. 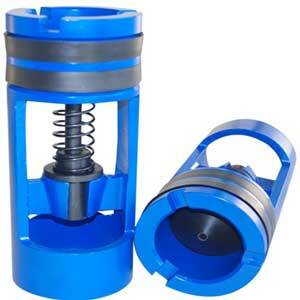 This pump pressure is equal to the total pressure loss in the circulating system.That’s why during circulation, pressure at any point in the well-bore will be due to mud weight plus the pressure loss in the system. 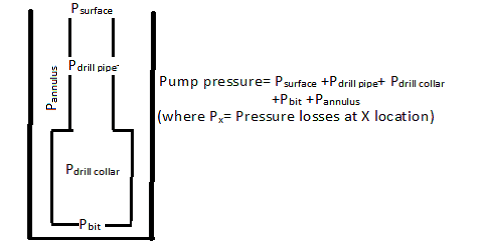 ECD is always calculated for annulus as it has no importance inside the drill string that's why we can replace pressure loss in the system with annular pressure loss. ECD can also be defined as the density equivalent of circulating pressure in the annulus. For safe drilling it is must to keep the ECD lower than the formation fracture gradient otherwise the formation will fracture that's why ECD is continuously monitored while drilling. Note:-During circulation ECD will always be greater than or equal to Mud weight. is it possible that ECD and mud weight maintaine together for safe drilling? if mud weight is greater than pore pressure ECD will obviously be higher than pore pressure and Ecd<fracture pressure means mud wight is also less than fracture pressure. Mud weight(by mud engineer) and ECD(by MWD) are continuously monitored for changes and maintained accordingly.